UPDATE: Was the stabbings in Texas due to a gang-related fight between Hispanics and AfricanAmericans? Three suspects in custody appear to be Latinos. One dead victim has been identified as 16 year old AfricanAmerican student Joshua Broussard. Harris County (Texas) Sheriff's Office said one person is dead after a stabbing in cafeteria at a Spring ISD high school. The incident happened at the high school on Cypresswood at North Freeway. Multiple people were stabbed, with at least one death and three injured. It happened around 7 a.m. Wednesday, September 4, 2013, at Spring High School, in Spring, Texas. Authorities have not released any other information about the names or continuing condition of the victim who was killed, those injured, or the suspect. 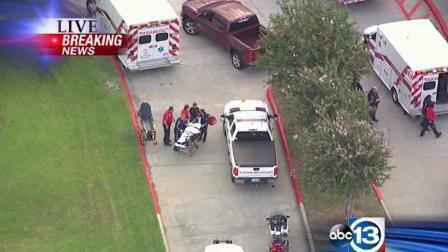 Life Flight airlifted a 16-year-old boy to Memorial Hermann-Texas Medical Center. Officials have not said how many others were injured. Spring High School, off Interstate 45, is a public high school located in the Spring CDP in unincorporated Harris County, Texas, United States. Spring High School, which serves grades 9 through 12, is a part of the Spring Independent School District. The school is north of Houston. Further details will be added as they come in. Memorial-Hermann is where Gabby Giffords was treated.